Sat., Aug. 19, 2017, 4:19 p.m.
Hey, everybody: Did you hear why Notre Dame went 4-8 last season? Why a football behemoth with every conceivable competitive advantage couldn’t beat Navy, Duke, North Carolina State or Michigan State’s worst team since the ’80s? Turns out that Brian Kelly had to multitask. “Its coach had to spend too much time, he said, fundraising for a football-only facility and not enough time making sure he had a firm grasp of his team’s physical and mental focus. 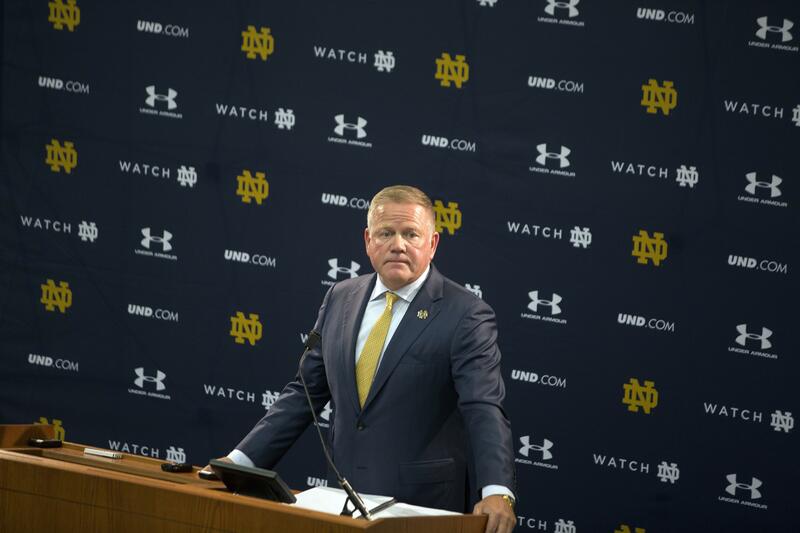 Think about that: The head coach at Notre Dame – which at one point was paying two coaches to not coach (Tyrone Willingham, Charlie Weis) while paying Kelly – was fundraising for a facility during the season. So a team with an NFL-caliber quarterback in DeShone Kizer, a team that opened the season ranked 10th in the nation, couldn’t win five games because the head coach was … too distracted? This is supposed to pass for an actual excuse? So it wasn’t that an out-of-touch Kelly made awful decisions regarding his staff? Kelly fired defensive coordinator Brian VanGorder after Notre Dame’s 1-3 start and in the offseason brought in a new offensive coordinator, new special teams coach, new strength coach and, according to SI.com’s Pete Thamel, a total of 17 new staffers. My word, can Kelly hire someone to give him a dose of reality? Notre Dame lost last year at N.C. State because Kelly coached as if his team were playing in the Superdome. With Hurricane Matthew swaying the light posts at Carter-Finley Stadium (51-mph wind gusts), Kelly had Kizer attempt 26 passes. During one stretch, 12 straight fell incomplete. The game’s only touchdown came on a blocked punt. The Irish had just two players, rather than the usual three, back to protect Tyler Newsome, who was expected to rugby punt. He went conventional, and three N.C. State players zeroed in. A day later, the narrative was that Kelly had gone low by supposedly calling out center Sam Mustipher for his poor snaps on a brutal, muddy field. Kelly did call the snapping “atrocious,” but he did not mention Mustipher by name. What he said was fine. I was there. Kelly actually did take the blame that day. Since then, Kelly’s message has been all over the place. Lou Holtz won big at Notre Dame with mediocre facilities, a relatively meager salary pool for assistants and higher academic standards than the program has today. Kelly should be grateful that Notre Dame is giving him a reboot. Texas, which embarrassed Notre Dame’s defense with a 50-point performance last season, finished 5-7. Texas also overhauled its staff. You know who got dumped? Charlie Strong, the head coach. Published: Aug. 19, 2017, 4:19 p.m.